We love it when our local growers bring us flowers that have just come in to season. These Zinnias have come direct to us from a flower farm in Swan Valley and are some of the best we’ve ever seen! This beautiful bouquet of a dozen red roses was made for a customer who wanted something a little bit different sent to his wife in Warnbro for their anniversary. With Baldivis being one of Perths fastest growing suburbs, the team of talented florists here at Hanging Basket Florist are flat out busy with with flower deliveries to that area. These beautiful Tulips which have just come into season are destined to be made in to bouquets for delivery to Baldivis. In addition to our fresh flower arrangements and bouquets, we also have plants, terrariums, nappy cakes and gift baskets available for delivery to Baldivis, Settlers Hills and surrounding areas. With Mothers Day fast approaching, now would be a great time to become a Hanging Basket Florist VIP to get great savings on flowers and gifts delivered to Baldivis. Hanging Basket Florist are the only florist near Baldivis that is open 7 days a week. Visit our website, call us on (08) 9527 5562 or come in to our store at Rockingham Shopping Centre to send beautiful flowers and gifts to Baldivis. We love supporting local businesses, keeping money in the Rockingham community. Hanging Basket Florist are open every Sunday and most Public Holidays, like Australia Day, from 11 AM to 4 PM at Rockingham Shopping Centre. We have a wide range of fresh flowers, plants, chocolate bouquets, gift baskets, artificial flowers, teddy bears, and balloons available. 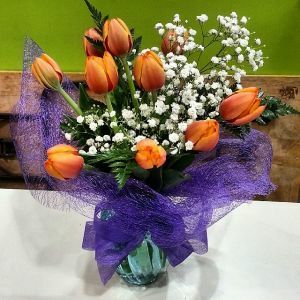 To order flowers for delivery Mon – Sat please call (08) 9527 5562 or visit www.hangingbasketflorist.com. With Spring flowers like Tulips coming to an end we can look forward to warmer weather flowers like these fantastic Gladioli which have just come into season. These gladioli are grown in the Swan Valley and are up to one metre tall. We buy WA grown whenever possible.